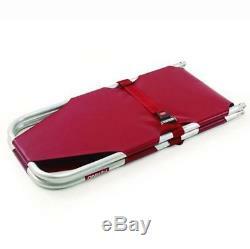 Ferno 12 Folding Emergency Stretcher. The Ferno 12 Folding Emergency Stretcher is a lightweight, aluminum cot that can fold in half for easy storage. Includes a nylon cover and patient restraints. Warranties: Frame - 2 Years; Soft Goods - 90 Days. While the Ferno Model 12 Emergency Folding Stretcher is lightweight, the frame can undergo heavy-duty work and supports up to 350 lbs. The nylon cover is vinyl-coated and bacteriostatic, with patient restraints attached to keep patients secure. 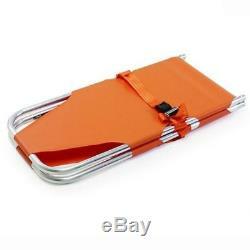 When not in use, users can fold this stretcher in half for compact storage. 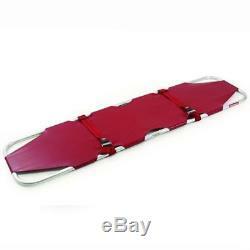 Ferno 12 Folding Emergency Stretcher Features. Folds in half for compact storage. Bacteriostatic nylon cover is easy to clean. Supports up to 350 lb loads. Ferno 12 Folding Emergency Stretcher Specifications. Weight: 8 lbs (4 kg). Load Limit: 350 lbs (159 kg). Width: 18 in (47 cm). Height: 1 in (2.9 cm). Folded Length: 37 in (94 cm). Open Length: 74 in (187 cm). Ferno 12 Folding Emergency Stretcher Configurations. Ferno 12 Folding Emergency Stretcher Accessories. Ferno 385-A Pole Stretcher Carrying Case. Food and Drug Administration and state and local regulatory agencies. Listing and template services provided by inkFrog. 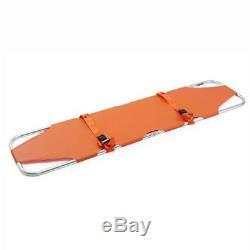 The item "Ferno 12 Folding Emergency Stretcher" is in sale since Friday, August 17, 2018. This item is in the category "Business & Industrial\Healthcare, Lab & Dental\Medical, Lab & Caregiving Furniture\Stretchers & Backboards". The seller is "mfimedical" and is located in San Diego, California. This item can be shipped to United States.